The radiation belts of Earth and Saturn differ more strongly than previously assumed. In these belts, very energetic particles, such as electrons and protons, move around the planet at high velocities - captured by its magnetic field. In the case of the Earth, the solar wind, a current of charged particles from the Sun varying in strength, controls the intensity of the radiation belt both directly and indirectly. The radiation belts of Saturn, however, develop completely independently of the solar wind and are instead decisively influenced by the gas giant's moons. These results are published today in the journal Nature Astronomy by a group of researchers from the Max Planck Institute for Solar System Research (MPS) in Germany co-leading the most comprehensive study on the subject to date. 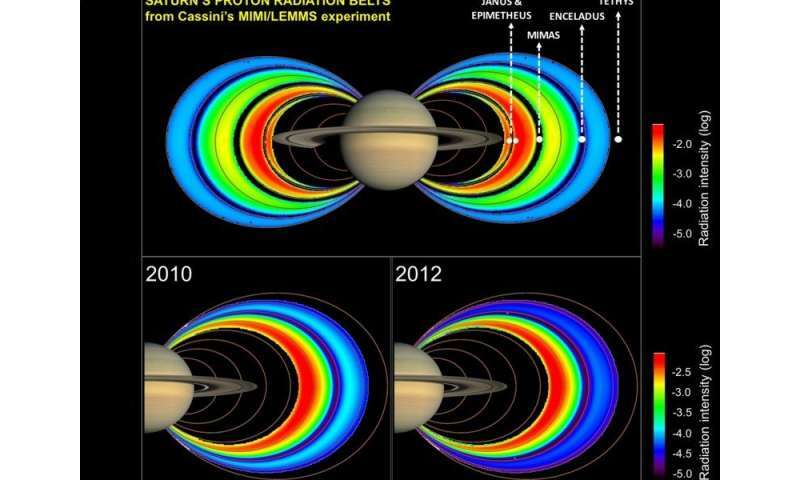 Key to the new findings are measurements of the MIMI-LEMMS instrument aboard NASA's Cassini space probe, which explored the Saturn system for more than 13 years before its dive into the planet on the 15th of September this year. The activity of the Sun – and with it the strength of the solar wind – follows an eleven-year cycle. Investigating the long term influence of the solar wind on a planet's radiation belts therefore requires patience – and space missions of a considerable length. "If Cassini's mission to the Saturn system had ended after four years, as initially planned, we would never have been able to achieve these results," explains Dr. Elias Roussos of the MPS. Fortunately, the mission was extended several times. The Magnetospheric Imaging Instrument (MIMI) with its high energy particle detector (LEMMS) on board Cassini was therefore able to record the distribution of charged particles in the vicinity of Saturn over a period of time that includes a complete solar cycle. "Such extensive in-situ data on the radiation belts of a planet are otherwise only available for Earth," says MPS researcher Dr. Norbert Krupp, who heads the MIMI-LEMMS team. As data from Cassini show, Saturn's proton radiation belts are gigantic: they reach from the planet's innermost ring to the orbit of the moon Tethys – and thus more than 285,000 kilometers into space. A decisive difference to Earth: while our moon is located far beyond the limits of the magnetosphere and the radiation belts, Saturn's radiation belts contain several of its satellites, such as the large moons Janus, Mimas, and Enceladus. "Saturn's moons influence the radiation belts decisively," says Krupp. They act as a kind of boundary wall on very energetic particles, particularly protons. Any protons diffusing further inwards from their place of origin are absorbed and thus stopped when they interact with a moon. "This creates areas in the radiation belt which are completely isolated from one another," says Roussos. Unlike Saturn, particles arising outside Earth's radiation belts may travel inward and replenish its content. On Earth, the high-energy particles that form the radiation belts have two origins. Some are provided directly by the solar wind. Others result from incident protons of extreme energy originating from our Galaxy, called Galactic Cosmic Rays. When Galactic Cosmic Rays reach the planet's atmosphere, it sets in motion a chain of reactions, at the end of which high-energy electrons and protons are created. Since the solar wind partially shields and thus modulates this cosmic radiation, the Sun's activity also plays a decisive role in this process. In the Saturnian system this is different. "In the first years of the Cassini mission, we observed that the solar wind could cause dramatic changes in Saturn's magnetosphere," says Roussos. "However, this direct influence stopped abruptly at the orbit of the moon Tethys." Nevertheless, at first everything indicated that the solar wind still helps to shape the radiation belts – if only indirectly: the first years of the Cassini mission coincided with a decline in the Sun's activity; the intensity of the radiation belts increased as expected. In the period from 2010 to 2012, however, there was a rapid intensity drop that could not be attributed to the solar wind modulation of Galactic Cosmic Rays, which changes on much longer timescales. And also solar storms, violent eruptions of particles and radiation from the Sun, could not have been responsible. While time and again on Earth such events cause a sudden decline of intensity, extensive simulations performed by the researchers show, that this effect can also not explain the year-long decrease witnessed by Cassini. Rather, the scientists suspect that extreme ultraviolet radiation from the Sun may be responsible. This radiation can locally heat the atmosphere of a planet. The resulting turbulent winds transmit this information to the ionosphere which is "anchored" to the magnetosphere through the planet's magnetic field. As a result, the protons in the radiation belts spread out much more efficiently than usual. On their way, they encounter Saturn's moons and are absorbed: the intensity of the radiation belts thereby decreases significantly. "We observe that the intensity drop in the proton radiation belts of Saturn coincides exactly with strong changes in the EUV radiation from the Sun," Roussos describes the new results. It is therefore possible that while the solar wind has no impact on the radiation belts, the Sun still may. "Our analyses also remind us how strongly the properties of the radiation belts depend on the structure of the particular planet system, that is, the position and number of moons for the case of Saturn", says Roussos. This knowledge could also be helpful for a glance beyond the edge of the solar system: if in the future the radiation belts of an exoplanet could be detected, these data could also indirectly contain information about the system's properties and structure.